China is in advanced talks with the Colombian government to build an alternative to the Panama Canal. China is leading the world in one of the biggest strategic projects of the 21st century, one that will link the Atlantic and Pacific oceans, again. For centuries, visionaries dreamed of uniting the Atlantic and Pacific oceans by forging a path across Central America's slender isthmus. This single, ultra-strategic waterway, transformed the commercial map of the world. It not only lopped 7,000 miles off the New York-to-San Francisco shipping route avoiding Cape Horn, but also brought Europe much closer to Asia. Today, something new and equally dramatic is happening. China's Development Bank is preparing to invest $US7.6 billion to build a whole new rail-road Dry Canal on the Colombian side of the isthmus for the China Railway Group to ship goods from Asia to the Atlantic side of the fast-growing Latin American continent. The new 220km Dry Canal rail link would run from Cupica on the Pacific (involving the expansion of the Port Buenaventura) to a new port Uraba near Cartagena on Colombia's Atlantic coast. Imported Chinese goods would be assembled for re-export through the Americas and beyond, with Colombia-sourced raw materials filling ships making the return journey to Asia. This would give China its own 50m-tonne-per-year trade conduit avoiding Panama's US controlled pinch-point. In 2011, the Panama canal carries 300m tonnes of shipping annually – compared to the 80m it was designed to accommodate. Since it was built world trade has expanded enormously. Large modern cargo ships, including LNG gas vessels, simply cannot fit through which is why the canal's vast lock gates are currently being widened. China has established a new Strategic partnership with Colombia and the wider Americas region filling a vacuum in the breakdown in US-Colombia relations in recent years underlined by the US string-along-and-dither policy on whether to sign a free-trade pact with Colombia. There is a possibility that the rail links may extend through Venezuela to give it access to the Pacific and greater clout, and Brazilian companies may bid for some contracts. Colombia is the world's fifth largest producer of coal - currently most of it is exported from Atlantic ports to the US and Europe. The new Dry Canal rail-link would open up options for Latin American countries to export such resources, via Pacific ports, to Asia and China. The Panama Canal was and perhaps remains, one of the greatest feats of engineering in human history. 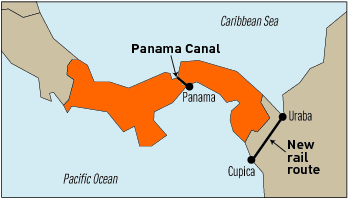 Once completed, the canal effectively ended the imperial battle of trade routes and did so in America's favour when it opened in 1914. The symbolism of the First World War breaking out in Europe while the 'New World' took control of the seas was unmistakeable. The symbolism is equally clear 100 years later emphasizing the might of China's modern-day economic and commercial power. Now I am busy in my bus trips from NYC to Boston but I have also for my next month plan to go China for visiting its beautiful canals as well as tourists point of view with two more friends. Cupica to Shanghai by ocean fleet may takes just about 10 days. Whereas Uraba or any Venezuela's port (not crossing Panama canal - high tolls rate and can't accommodate ULCC) may takes about 50 days to Shanghai. You can see what is the benefit of building rail and pipelines from Cupica to Uruba. Even the blind can see that !!!! 220 km rail from Uraba to Cupica together with oil and gas pipe would be more than viable. Colombia and Venezuela can use this pipe to pipe the oil to Cupica deep seaport and tanker will deliver the oil to Far East. Win-win for oil importer, for Colombia, for Venezuela and for FARC.